Kingsley Coman is a French professional football player. He was born on 13 June 1996 in Paris, France. He mainly plays the role of a forward and winger and is currently playing for Bayern Munich and the France national team. He started his career in the year 2002 at an early age of six with the football club US Sénart-Moissy. He spent two years there under the guidance of his father. Coman started with France U16 in 2011 where he went goal-less in nine matches then in 2012 he moved to France U17 where he scored 3 goals in 8 matches. In 2013, he debuted for France U18 and scored 1 goal in 6 matches. In 2013, he debuted for France U19 and scored 2 goal in 7 matches. Coman made his first appearance on 2nd June 2014 for the French under-21 team with a 6–0 friendly win over Singapore. He even scored one of the goals in the match. 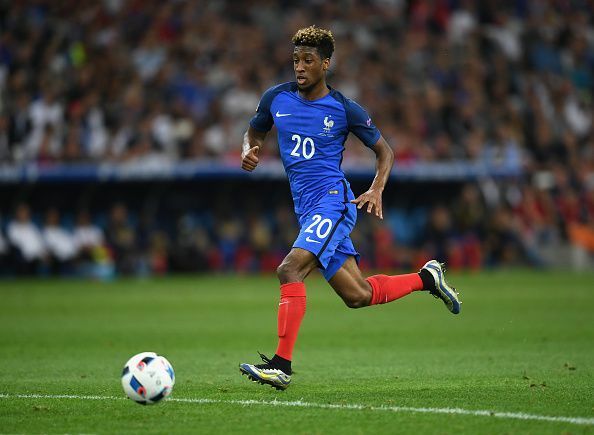 Coman was selected to the France senior squad on 5th November 2015 for the friendly matches against Germany and England. He made his debut on 13th November 2015 at the Stade de France in a 2–0 win over world champions Germany. On 29 March 2015 in the first match against Russia Coman scored his first international goal which was set up by Dimitri Payet and thus finalized a 4–2 win. Following his performances in UEFA Euro 2016 tournament where his nation reached the final, which was lost 1–0 to Portugal, he was nominated for the Young Player of the Tournament Award. Coman got himself playing for Ligue 1 side Paris Saint-Germain in the youth academy in 2004. After spending nine years in the club's youth category, Coman made his senior debut for the club on 17 February 2013 against Sochaux, which was a 3–2 defeat. At that time he was the youngest player to play for PSG. Then on 7th July 2014 Coman signed a five-year contract with Italian champions Juventus and transferred to Juventus from PSG. He made his Serie A debut on 30 August 2014 with a 1–0 away win against Chievo. He scored his first professional goal on 15 January 2015 in the last 16 of the Coppa Italia played against Hellas Verona helping his club post a 6–1 win. Coman was loaned to Bayern Munich on 30 August 2015 on a two-year contract worth of €7 million. On 12 September 2015, he made his debut in a 2–1 win over FC Augsburg at the Allianz Arena. A week later he scored his first goal for the club in a 3–0 victory against Darmstadt 98.